Endura's finest women's FS260 Pro SL DS Bib Shorts are scientifically developed to provide total comfort on long days in the saddle. Tried and tested by the world's top riders they are now available to all. The FS260 Pro SL DS Bib Shorts have been scientifically developed by Enudra to provide complete comfort. Composed from Italian Power Lycra®, to ensure optimal muscle support, and featuring coldblack® technology to dramatically reduce heat build up they have created their finest short yet. With the addition of their unique drop-seat (DS) zipped construction on the thighs you also get incredibly easy access for comfort breaks. ATTENTION: Please note these are "Medium Pad". 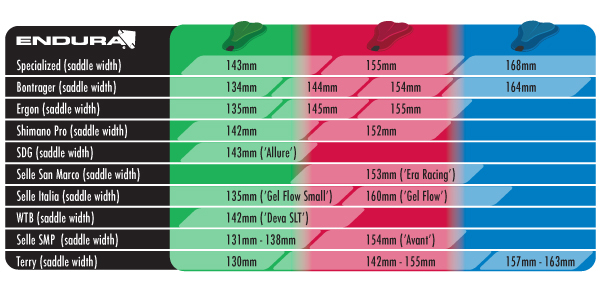 Please see size guide for more information regarding the fit of this pad. Scientifically developed with bike fit experts gebioMized and feedback from Endura’s female pro athletes the women’s 700 series pad shares the same market leading features as the men’s, re-shaped specifically for the female form. All sizes are available in three widths to allow a near perfect body match based on the rider’s body geometry, saddle and riding position. Endura’s high tech Continuously Variable Profile (CVP) technology provides supportive padding only where required, with all superfluous material removed to minimise bunching and friction and maximise moisture transfer and flexibility. The high stretch, antibacterial, fast wicking polyamide/ Lycra face fabric and multi-density, open-cell foam sandwich with flame lamination bonding provide outstanding stretch and moisture transfer. Dark colours attain a higher temperature than light colours when exposed to the same intensities of direct sunlight. coldblack® technology textile finishing reduces this effect by increasing the amount of infrared and ultraviolet UV rays that are reflected from the fabric’s surface, thereby dramatically reducing the sunlight heating effect. coldblack® also provides reliable protection from UV rays (minimum UPF 30). FS260-Pro SL is driven by science, tested by the world’s top riders and available to all. Market leading product innovations such as the FS260-Pro SL Bibshort, scientifically developed in conjunction with bike fit experts, gebioMized® and supported by a patent pending fit system and put through its paces by Movistar Team riders, demonstrates Endura’s commitment to pushing the boundaries of comfort and performance throughout this collection. Du får tilbudt tre alternativer for pudebredde for at finde det bedste match for bækken-geometri og rytterstil. Pudebredden findes ved at sammenligne mål for sædeben og sadelbredde med en måleoversigt eller, for en mere nøjagtig måling, ved at måle med Endura-gebioMized® PadFit ™-systemet (afventer patent), som går længere end andre systemer ved at kortlægge presset og tilpasse puden, så du får den ultimative oplevelse af komfort hele dagen lang. Se nedenstående grafik for en vejledende guide til den rette sadelbredde.